I register ALV events and enable them in WDDOMODIFYVIEW method. When the SAP user clicks on checkbox control displayed on an editable ALV control in Web Dynpro component, I can catch the user interaction using the ON_CELL_ACTION event handler of the ALV control. R_PARAM parameter of the Event provides ABAP developer all required information about the event details triggered like the row index, column name and the value of the column, etc. 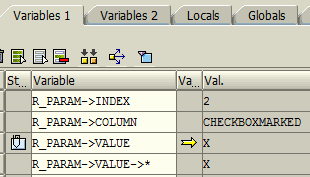 R_PARAM->INDEX is showing the index of the row displayed on the ALV table on Web Dynpro page. R_PARAM->COLUMN is showing the name of the column that the cell triggering the event belongs to. Unfortunately, developers can see the checkbox value on the debugger screen using R_PARAM->VALUE in order to use this in ABAP codes following syntax should be used. The R_PARAM->VALUE should be assigned to a field symbol and the value of this field symbol should be used within ABAP control statements. Using field symbol in <FS> = 'X' equality shows that the checkbox created in editable ALV table is marked. Otherwise developers can assume that the checkbox is cleared or unmarked.